Accurate identification of the many separate species of Hawkweed is not for the faint-hearted, and we tend to leave this to those who are experts in this complex and highly variable group of plants. Hawkweeds flower after many other species of wildflowers have died back, and so their cheery bright yellow (or orange in the case of Fox and Cubs) flowers are a most welcome sight late in the summer. In 2007 a new species of Hawkweed growing on the Isle of Portland in Dorset was identified. Originally found in 1879, it was at first thought that an endemic species from South Wales and closeby English counties had extended its range. The cliffs of the Isle of Portland in Dorset are internationally important for their geological interest and also home to a rich limestone flora. 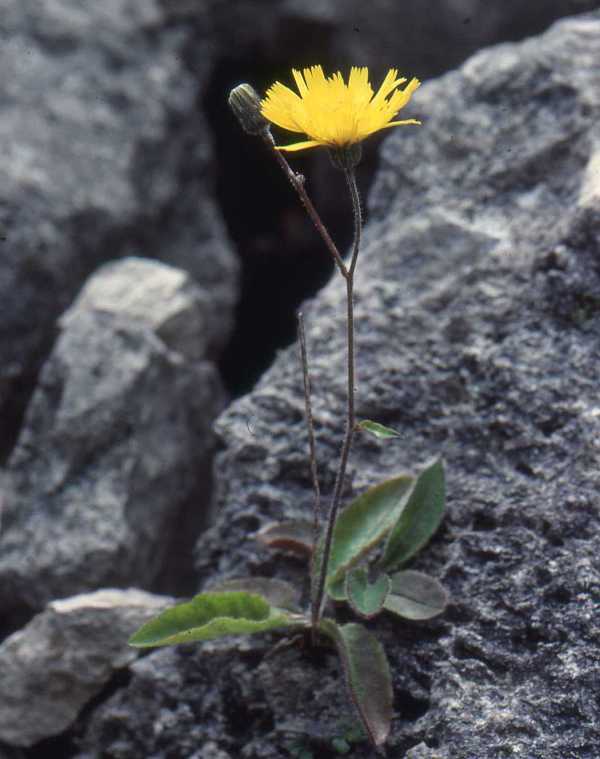 The Portland Hawkweed plants usually grow directly on rock or root into tiny rock crevices, and it is thought that they depend on mist from the sea for their supply of water and, hence, for their survival. Portland Hawkweed flowers from July to August. Picture by kind permission of Anne Horsfall.